A recently added fixture to the CML season gave us the chance to notch up our 100th game of the season. 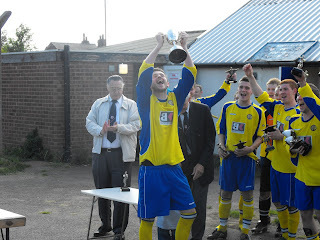 Played at the Stag Ground, home of Kimberley Town FC, CML Supreme Reserve Division champions Carlton Town took on CML Premier Reserve Division champions Yorkshire Main. The only seat available and Brian Dennett nabbs it!! Nice day out in the sunshine, decent turn out - and another chance to meet up with Rob Waite aka "Ian Midloth" - he had brought along his friend Adam, a Lincoln City fan... well, we're none of us perfect...!!!! 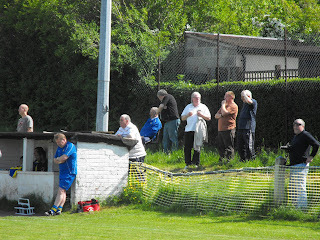 The football was of a decent standard, but nothing that made you want to take copious notes. More of the same for the first 15 minutes of the second period, then Carlton were awarded a penalty after one of their players was bundled over in the area. 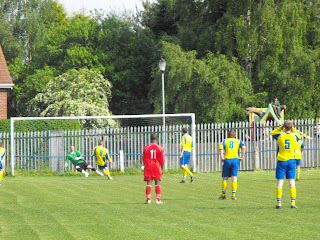 STEVE COX stepped up and calmly slotted home the spot-kick. There was a bit of nonsense after the game -- with the cups and trophies all lined up ready to be presented, Yorkshire Main were kept waiting by Carlton who had decided to have a team talk .... Some unpleasant language and abuse was directed at League officials by the Yorkshire Main contingent, and that was not really in keeping with the day. Attendance -- approx 100 ?